I've been reading with great interest recently about the heart chakra, about why it gets closed off from giving and receiving love fearlessly. It resonates greatly with me and I'm thinking it can be related to Vata as well, as the element associated with the heart chakra is air. My next post will be about the heart chakra some more. 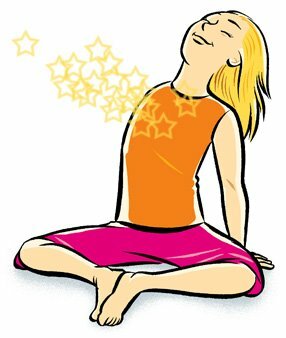 Meanwhile, here is a yoga stretch that is wonderful for opening up the heart. It's a gentle seated backbend that anyone can do. If you are hunched over your desk all day, or feeling low-energy, or have sadness in your heart, sit down in a quiet place and counteract all these constricting feelings. Sit with the soles of your feet together, or loosely crossing the ankles, and place your hands on the floor about a foot behind you. Bring your shoulders back, flare your heart up, and breathe deeply. Feel free to sigh audibly with your mouth open.